William Burrell and his wife Francis (née Turner) were among the earliest settlers in Burwood. William, a blacksmith and farrier, conducted his business in Toorak Road. Of their eight children, Doug, Jim, and Wilfred served during WWI. Born in 1891, Doug was the first to enlist and joined the 1st Signal Corps Australian Light Horse, arriving in Egypt for further training before going on to Anzac Cove on 12 May 1915. 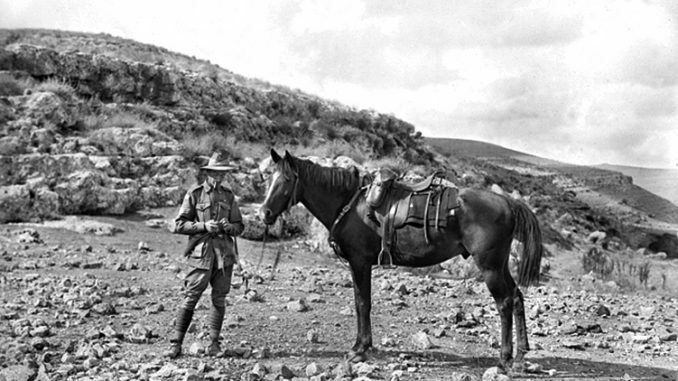 With the remainder of the Anzac Force, he was evacuated to Alexandria on 19 December 1915 and there joined the Desert Column formed to conduct mobile operations against the Turks in Palestine. Doug was promoted to Lance Corporal and was Mentioned in Despatches for bravery in the field during the battle for Rafa in January 1917. In November 1917 he was awarded the Military Medal for bravery in the field and in February 1918, was awarded the Distinguished Conduct Medal for conspicuous gallantry and devotion to duty in establishing and maintaining telephone communications under heavy shellfire during the battle for Jerusalem. The Burrell boys returned home safely following the armistice in the Middle East on 31 October 1918. Doug arrived on 24 December and he and his wife Ellen, whom he had married just prior to leaving for overseas, settled in Balwyn and he joined the Tramways. On completion of the Shrine of Remembrance fifteen years later, the Police Commissioner was authorised to select highly decorated WWI veterans to be employed as Shrine Guards and in April 1935 Doug joined the Police Force specifically for duty at the Shine. Francis Douglas Burrell DCM MM served as a Shrine Guard until August 1951. He died 14 years later and was interred at Box Hill Cemetery. The names of the three Burrell brothers are remembered on the Roll of Honour at St Faith’s Anglican Church, Burwood, the Burwood War Memorial in Warrigal Road and Burwood Primary School’s Honour Roll. The stories of the men on St Faith’s Roll of Honour have been recorded in a booklet called From Orchards to Trenches, copies of which can be ordered from the parish office for $10 plus postage. The plan of the Premier (Sir Stanley Argyle) for the guarding of the Shrine of Remembrance by former members of the A.I.F. is likely to be realised, though in a modified form. The original proposal was that there should be a guard of about six to eight men at the Shrine and to replace the usual police guard at the gates of Government House; also that there should be a ceremonious changing of the guard at certain hours each day, done in such a way that the public would be attracted to witness the spectacle. The Police department was willing to co-operate, and so was the Defence department, but the Minister for Defence (Senator Sir George Pearce) pointed out that the disadvantage of employing men who were only soldiers for such a task was that they would not have the power of arrest. This difficulty seems to have had some weight, for the Premier has now compromised to the extent that the guard shall consist of policemen who are returned soldiers, and that they shall wear the old A.I.F. uniform. It seems to be a happy way out, for the guard will now be able to arrest intruders (who have already done slight damage to the Shrine), and the Shrine will be guarded by men who were comrades of those whom the Shrine commemorates.